A fine 1823 cover from Stoke Ferry to Lynn with a fine 'STOKE FERRY' town stamp on reverse (Willcocks NK373, Rarity 'D'). made with love by. Add to Favourites. Fine rubber skeleton datestamp of THULSTON DERBY on a 1933 Thunderstorm report card, with lots of written detail. Scarce item. With contents. Add to Favourites. A fine 1794 lettersheet from Exeter to the Right Honourable Lord Clifford, rated 1d with a fine strike of the circular type EXETER (Willcocks DN567, Rarity 'D'). Interesting and extensive political contents. 57 x GB Decimal air letters Used. Different denominations, designs, first day, special cancels etc. Very mixed condition. 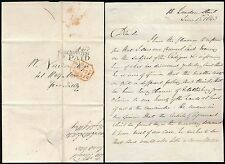 A fine 1853 lettersheet from Thetford to Wymondham. With contents. Add to Favourites. Postally used coverwith imperfections as scanned; has only minor postage wear; see scan which forms a part of this description. All postcards and ephemera will be sent in card backed envelopes, marked do not bend, for protection. This leads to somewhat higher postage costs, but ensures you receive the card as advertised, hence the slightly higher postage cost. Please see my other items. Part outer wrapper used in London; Bond St in red; 2 handstamp in black; bird red wax seal on the back. Emartenetpre emartenetQV emartenetKE7 emartenetKG5 emartenetKG6. A fine 1819 entire from Thetford to Cheshire 'THETFORD/81' Mileage Mark (Willcocks NK419, Rarity 'B'). Add to Favourites. A fine 1810 entire from Wymondham. Fine strike of a black straightline 'WYMONDHAM/108' mileage mark (WILLCOCKS NK489, Rarity 'C') on the front. Black circular RH stamp on reverse (22/1/1810). made with love by. A fine 1814 entire from Thetford to Lynn with Thetford Mileage Mark (Willcocks Rarity 'B'). With contents. Add to Favourites. made with love by. A fine 1816 entire to Wymondham. Fine strike of a black straightline 'WYMONDHAM/108' mileage mark (WILLCOCKS NK487, Rarity 'B') on the front. Add to Favourites. EmartenetQV emartenetKE7 emartenetKG5 emartenetKG6 emartenetQE2. Emartenetsweden emartenetnorway emartenetdenmark emartenetfinland emarteneticeland. EmartenetQV emartenetKE7 emartenetKG5 emartenetedinburgh emartenetscotland. Emartenetpre emartenetQV emartenetKE7 emartenetKG5 emartenetscotland. Early good strike of a straightline EXETER (WILLCOCKS DN552, Rarity 'E') - possibly the earliest recorded of this particular cancel. made with love by. Add to Favourites. A fine 1800 cover from Worstead. Fine strike of a black straightline 'WORSTEAD' town cancel (WILLCOCKS NK470, Rarity 'E') on the front. Red circular RH mark on the reverse (7/3/1800). Add to Favourites. A fine 1840 entire to Wymondham. Fine strike of a black circular 'WYMONDHAM' town cancel (WILLCOCKS NK490, Rarity 'B') on the front. Red circular 'PAID' stamp (29/4/1840). Add to Favourites. LOW START PRICE - MUST BE WORTH A LOOK! REST OF THE WORLD £2.60. The cancel reads 'Teal', which is an error for 'Zeal'. Add to Favourites. A fine 1823 entire from Thetford to Norwich. Fine 'THETFORD/81' Mileage Mark (Willcocks NK421, Rarity 'B'). Add to Favourites. HAS WIDE WHITE MARGIN WITH DATE 1- 41 AND COIL NUMBER 120. SINGLE 1/2d GREEN STAMP. F.D.C DATE 1 SP 41. Has an EXETER CDS (13/2/1845). Add to Favourites. 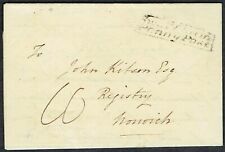 Red '1' strike on front, NORWICH CDS (23/9/1841) on reverse. Add to Favourites. A fine 1818 entire from Watton to Norwich, rated 7d. Wavy 'WATTON' town stamp with letters at odd angles (WILLCOCKS NK448, Rarity 'H ') on the front. Add to Favourites.